Croton Point Park is really an amazing gem tucked into a north west corner of Westchester County, right on the Hudson River. And when I say “on” the river, I really mean it – the park is actually located on a very large peninsula jutting right out into the middle of the river. With four miles of park coastline running along the river, I am not exaggerating when I say this park offers the most stunning and breathtaking views of the Hudson River anywhere around here. As we explored the park, around every bend there was yet another breathtaking view. I couldn’t help thinking of that strange phenomena that happens to us all – sometimes we travel far and wide looking for beauty and wonder when it might actually be right in front of us all the time. The most fun we had all day was hiking to “Teller’s Point” – the very tip of the peninsula. We drove about halfway into the park, parked our car in a lot, and then hiked the rest of the way, watching as the water views on both sides of us got closer and closer to us as the peninsula narrowed to its tip. The main part of that hike was easy– a well maintained path, no hills, less than a mile. Appropriate for anyone. At the end of the trail, there is a drop off- straight down a small cliff, right to the waters edge, below. The cliff isn’t that high and over the years people have carved a very rough steep path into the cliff to get down to the waters edge. As I reached into my bag for a sip of water and started to debate the pros and cons of attempting to go down the cliff, I blinked once and my kids were gone. Apparently, rock scrambling is in their blood. So, I had no choice but to follow them – and I am so glad I did. At the bottom, Teller’s Point offers a truly spectacular feeling – a sense of standing right in the middle of this majestic river. 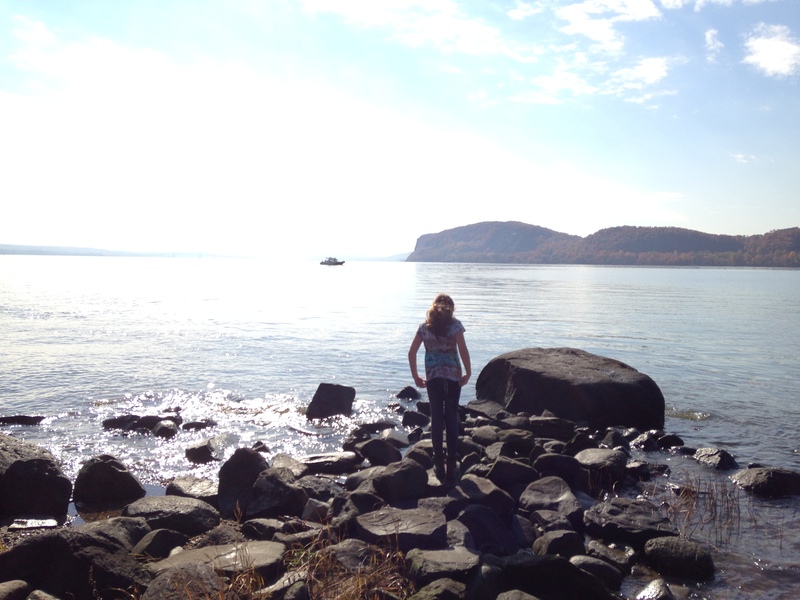 For the adults in the audience, the rocky shoreline offers the perfect spot to climb on a boulder, take a few deep, cleansing breaths, and wonder at the history, immensity, and timelessness of this place. If you happen to be a member of the younger set, it’s the perfect spot to do some rock-skipping, get your feet wet, explore the shoreline for river treasure, and think about the fact that both pirates and war ships once anchored off this very spot. Which brings me to my next fun fact- the park is chock full of history. As I love to mention, feeling the history of a place adds a sense of awe and lets your imagination wander as you think of all that came before you. A few intesting facts: Native Americans inhabited Croton Point as far back as 7,000 years ago. That’s a mind numbing thought – 7,000 years ago, there was likely someone sitting in the same spot where we sat, enjoying the same spectacular view. I just love that. 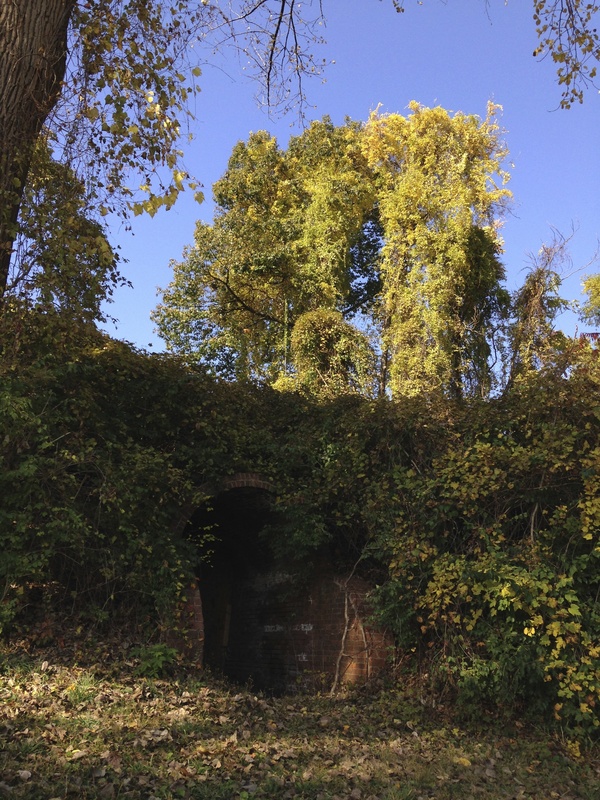 All through the park are historic points of interest, such as the remains of old wine cellars from the 18th century, now hidden under spreading vines; gorgeous, giant trees, at least 150 years old, listed on the New York State Historic Tree Register; and even remnants of the foundation walls from Native American settlements. Trails– Come for a hike, there are miles of trails here. 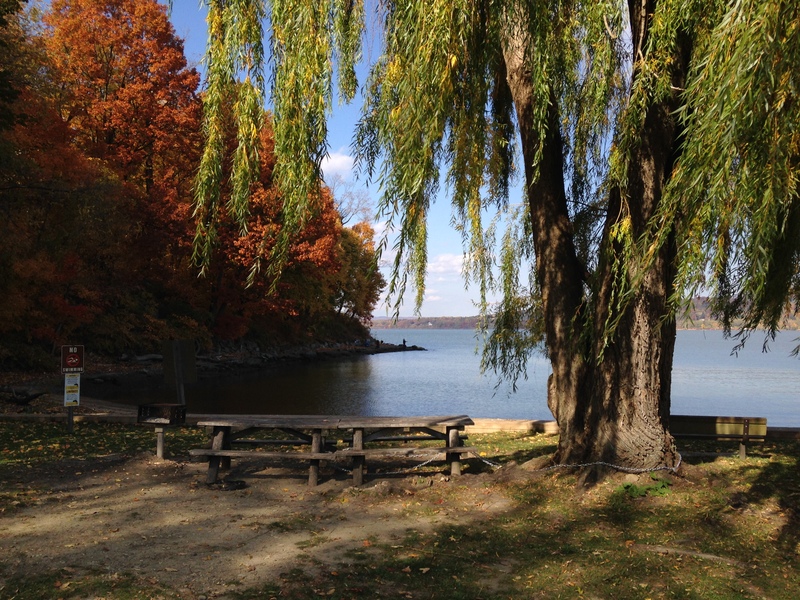 Picnic tables, grills, and benches, all with breathtaking views – Come for a picnic. Bring friends. Stay an hour or a whole day. 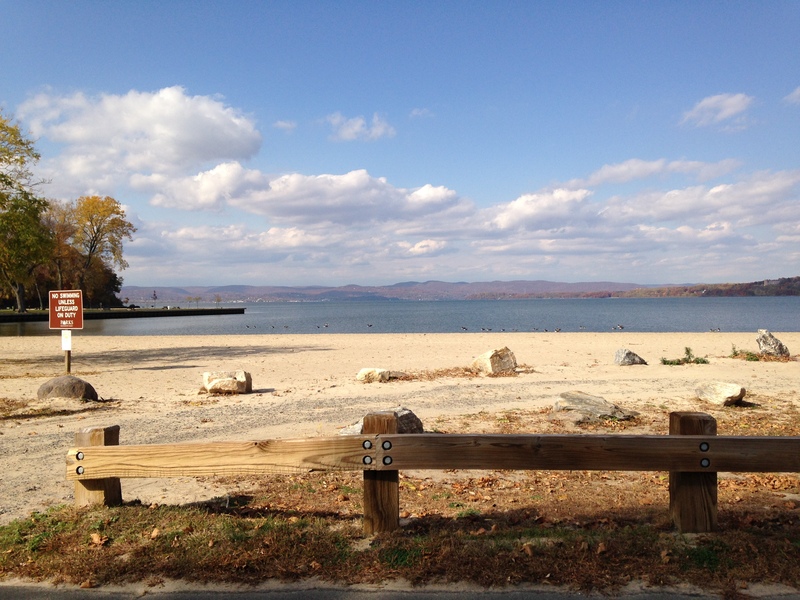 A beach- A small sandy swimming beach, right on the Hudson. During the summer you can swim– but kids love playing on a beach anytime of the year. Build a sand castle. Run your toes through the sand. Fishing– I was surprised to see so many people fishing here. It’s not my thing, but for those who love to fish – I suggest catch and release. Playgrounds– I spotted two, both being put to good use. Nature Center- We didn’t get a chance to visit it on this trip, but I’m definitely going back for this. Bird Watching – Bald Eagles nest here in the winter. Very cool. 2. There is something for every age range here. 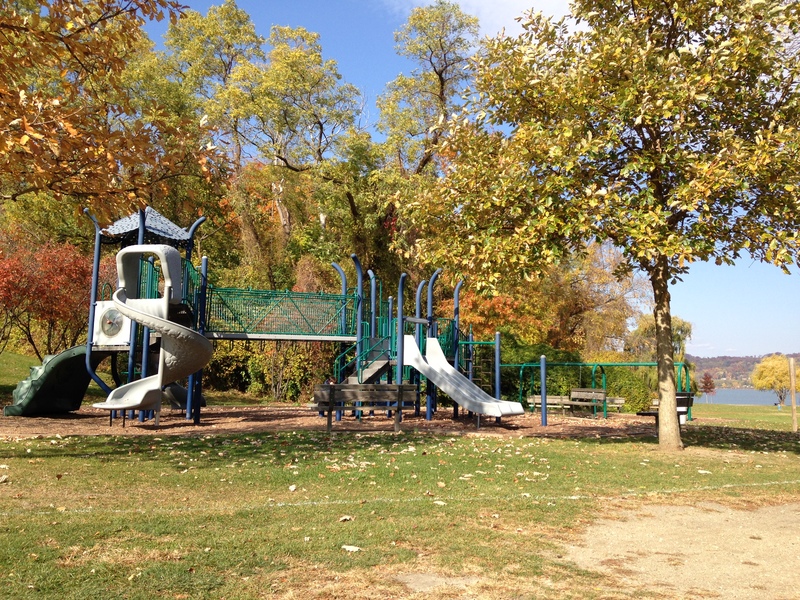 The beach and playgrounds, picnic tables and nature center are perfect for the youngest of kids. 3. Teller’s Point – the hike to the bottom of the cliff I mentioned – is NOT for young kids or the faint of heart. Getting down was not too bad but getting back up was very tricky! Be careful. Regular hikers and climbers only. 4. As I mentioned, the park is huge. Plan accordingly. Check your park map online and make a plan before hand, so you know where you are headed and you don’t miss the things you really want to see. So, I was right – this was an excellent place to see the last remnants of the fall color – but it was so much more. Can you tell that I think this park is an excellent way to spend your next Happy Day? 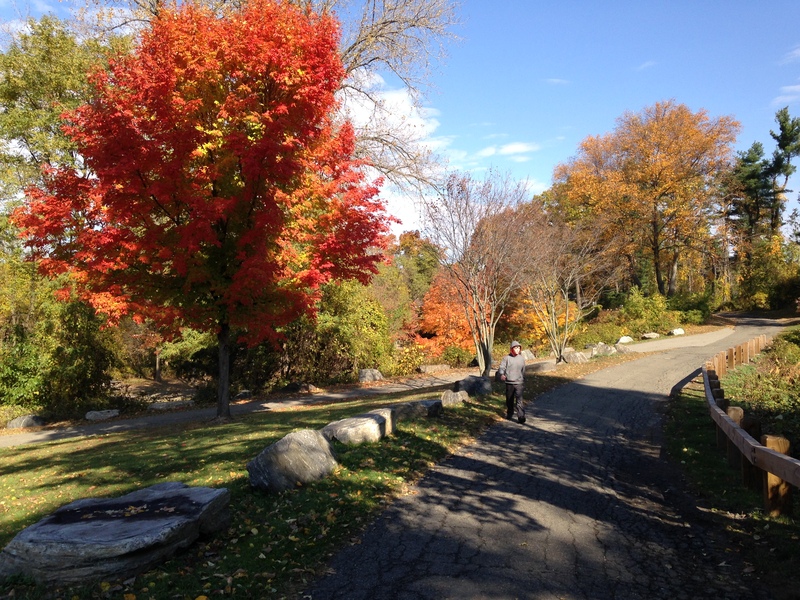 Have you been to Croton Point Park? Do you want to go? Any questions? I’d love to hear from you in the comments. sounds great. yet another spot i’ve heard about but haven’t visited. will put it on my list! Carol, yes! Definitely put it on your list. The whole family will love it here. Looks like so much fun….will have to put this on my bucket list! Gigi, yes – this is definitely a “bucket list” kind of place. Beautifully written, I wish I was there. Thank you for the compliment. You should plan a trip there soon! Love the website and how you add what to know and certain information about the place that you are going. Harrison, thanks for the great feedback. Wonderful blog. This entry makes me want to jump in the car this weekend and head to Croton Point Park! Thanks Christine! You definitely should. Get there while there are still some leaves on the gorgeous trees. Thanks for adding to our list of places to explore. Will definitely try it out! WHM- glad I could help. I think you’ll love it!